A claim for a Chicago doctor who suffered a fractured collarbone on Chicago's lakefront bike path was successfully resolved outside of court by Attorney Mike Keating. The case stemmed from a bicycle vs. bicycle collision that occurred when another bicyclist "cut-off" the doctor and knocked the front wheel of the doctor's bicycle. This collision caused the doctor to lose control of his bicycle and fall forward on the the hard lakefront path. As is often the case when a person falls off of their bicycle they instinctively put out their hands to protect their head. The force from this impact typically results in a broken clavicle, commonly known as the collarbone. This sequence of events is what is commonly referred to as the "mechanism of injury"
The insurance company for the bicyclist who caused this collision originally denied the claim. The insurance company's argument was that the doctor should have been paying closer attention and avoided the collision. However, the insurance adjuster was uneducated in bicycle law and the common practices among bicyclists in Chicago. Attorney Mike Keating was able to document that ordinary care for a bicyclist on Chicago's lakefront path is to call out "on your left" prior to passing and to only pass when it is completely safe to do so. Since the bicyclist did not use ordinary care in the use of their bicycle, under Illinois law he was negligent. Once the insurance company was convinced that their insured was at fault and could not avoid these facts at trial, they then entered into substantive negotiations to avoid a lawsuit. 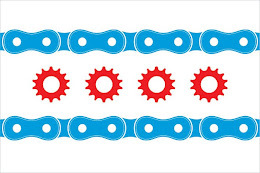 If you have any questions regarding this post or an issue involving Illinois personal injury law, please contact the Illinois Bicycle Attorney Mike Keating at 312-208-7702 or MKeating@KeatingLegal.com. All initial consultations are confidential and free.